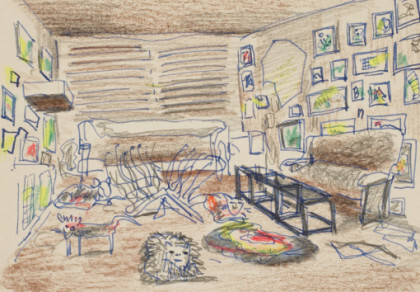 Another movie review: Herb and Dorothy Vogel married in 1962, cultivated a mutual love of art, and obsessively began collecting. They lived in a rent controlled apartment--he worked at the post office and she at the Brooklyn Public Library--and steadily amassed a collection of 4,782 pieces of conceptual and minimalist art that they eventually gifted to the National Gallery. A traveling show, Fifty Works for Fifty States, appeared in Oregon at the Portland Art Museum in Winter 2010. Sadly, I missed it. ...is the title of a 2003 Kiefer Sutherland movie about Post-Impressionist and early Colorist Paul Gauguin. Haven't heard of the movie? No wonder--it's not very good. But is does do a good job portraying an artist's passion to create, especially something new, and dramatizes the sacrifices artists and their families make in the pursuit of art. Memorable quote: "To create something new it is necessary to go back to the infancy of humanity, face to face with the mystery of our origins--where do we come from? what are we? where are we going?" 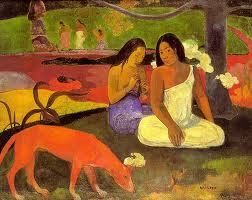 Gauguin created something new--by referencing something old. His explorations of symbols and "primitivism" in the 1890s eventually led other artists into the world of Surrealism. Since early childhood "being an artist" has been my strongest desire. I'm going to use this blog to discover what "being an artist" means, to explore my creativity and to hold myself accountable. You can sign up to follow my blog by clicking the "Join this site" button and if you do so by October 15 (my 58th birthday) your name will be entered into a drawing for a $58 credit toward the purchase of one of my paintings (current work ranges in price from $60 to $200). I welcome you to observe my progress as an artist and a blogger, and to provide your feedback. Thanks, and love.